Painting grapes, while fun, is also something that can get old. Imagine painting tomatoes: you might paint a tomato or three in a single painting. 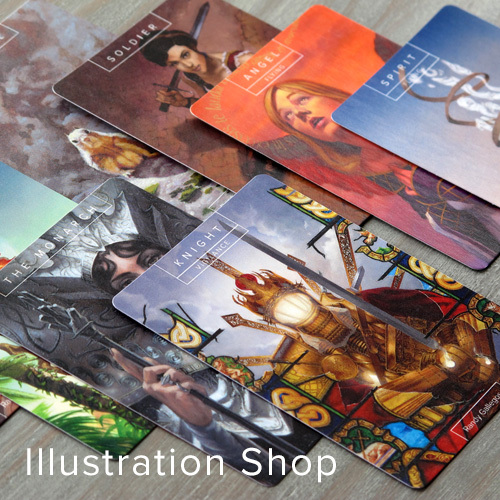 Done that way, you might get a number of paintings out of the subject matter before you tire and turn to something else. But you can also paint tomatoes in bunches, on the vine. Done this way, six or seven at a time, you will more quickly get fatigued. So it is with grapes. Painting a bunch of grapes necessitates a good 20-30 individual grapes being painted. And a painting of a single grape would probably be...odd. 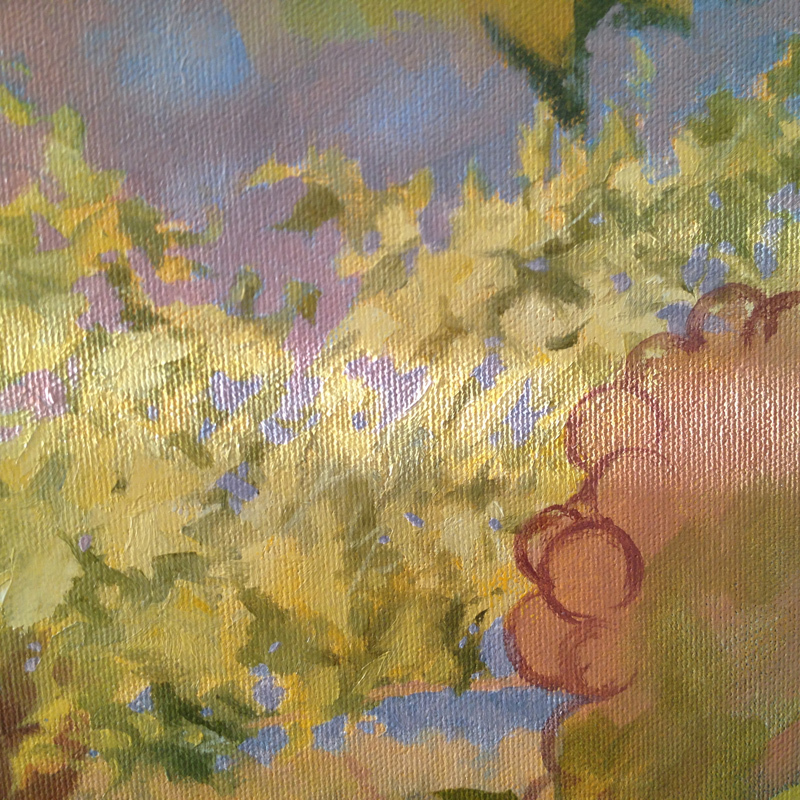 So working on vineyard paintings I've tried to change up the compositions quite a bit from piece to piece. When focusing on a single bunch, I went from back to front light. For the most recent two, I pulled the view out to reveal more landscape besides, while also picking different lighting conditions. So it was with Midsummer. I think this was a Zinfandel block, but the particular grape was less the point versus capturing a broader bit vineyard besides. As well, at this particular point in midsummer, there was this strange juxtaposition of some bunches of grapes still turning color while others were well advanced already, side-by-side. One doesn't often see that. This painting was begun in that early August period but I didn't progress far as I had a number of lengthy interruptions to studio time. And right when I'd blocked out some time in mid-October to complete it, the Santa Rosa firestorm occurred, which included me being evacuated from my home for about a week (on an advisory basis, not mandatory, but given the immense threat, we got he heck out). When I returned, I could no longer resume work as I was butting up against other scheduled paintings. So, it waited until early 2018, which found me painting the colors of midsummer in mid-winter instead. Nevertheless, the breaks afforded me some opportunities to reconsider the painting, so that each time I resumed it, I ended up repainting portions and making edits, all of which I think improved it. This painting in particular evidences a more impressionistic handling of the paint and palette than typical for me. It was possibly the most challenging aspect of the painting, but one which I enjoyed. This might be just outside my comfort range--often with experiments like this, I venture out of my artistic home, as it were, and look for things in other places that can't be found back home. While I might not prefer staying in those other spaces, there are always interesting things I find, that I bring back with me, things I would not have come across if I'd stayed in my usual zone. Perhaps this is how development of style happens. 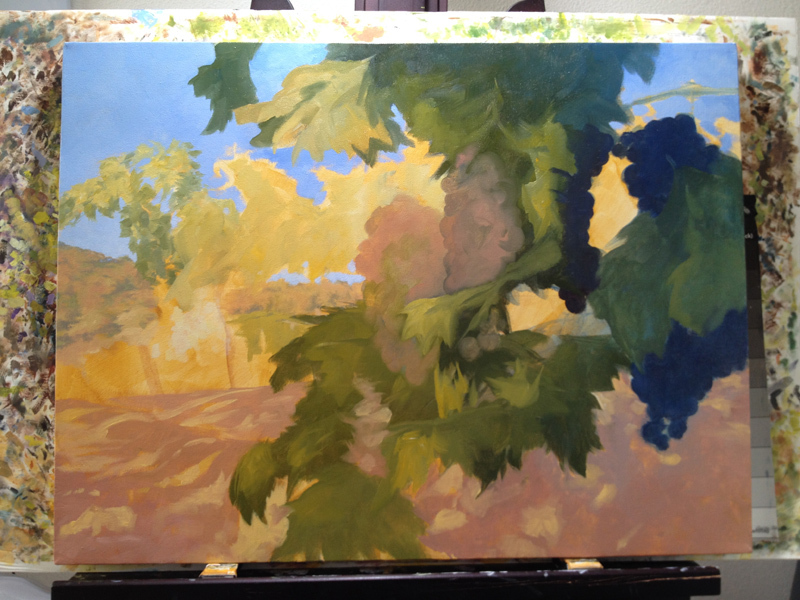 Having produced four vineyard-specific paintings in this series, I decided that I should take a little break from the grapes. 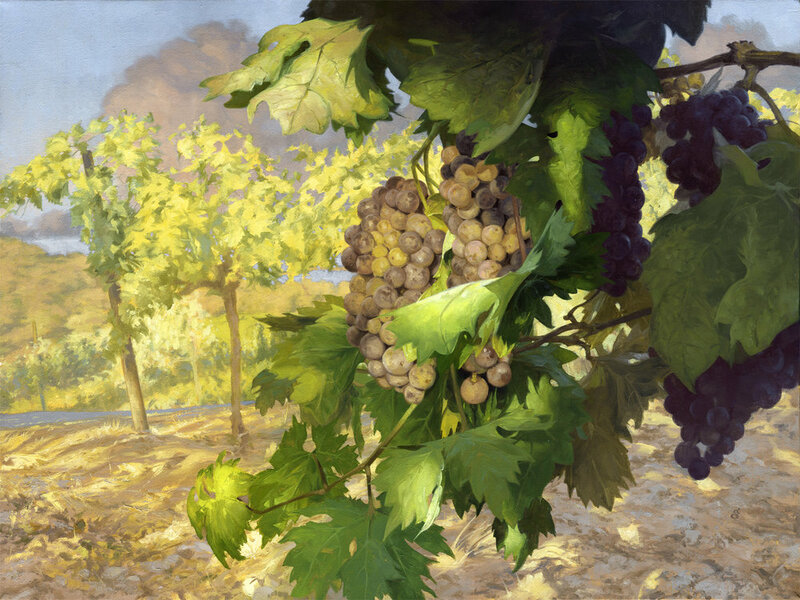 It wasn't my intention to become a vineyard painter in particular--although I imagine such a thing would prove quite popular. Rather, I intend to paint more variety, especially seeing how diverse the region of Sonoma County is. But I'm sure I'll be back--vineyards are after all a rather wonderful aspect of the region and there's a lot more to explore there. I was honored to have this painting selected for the Oil Painters of America 2018 Annual Juried Exhibition, June 1 - September 3 at the Steamboat Art Museum, Steamboat CO. Purchase inquiries can be made there.